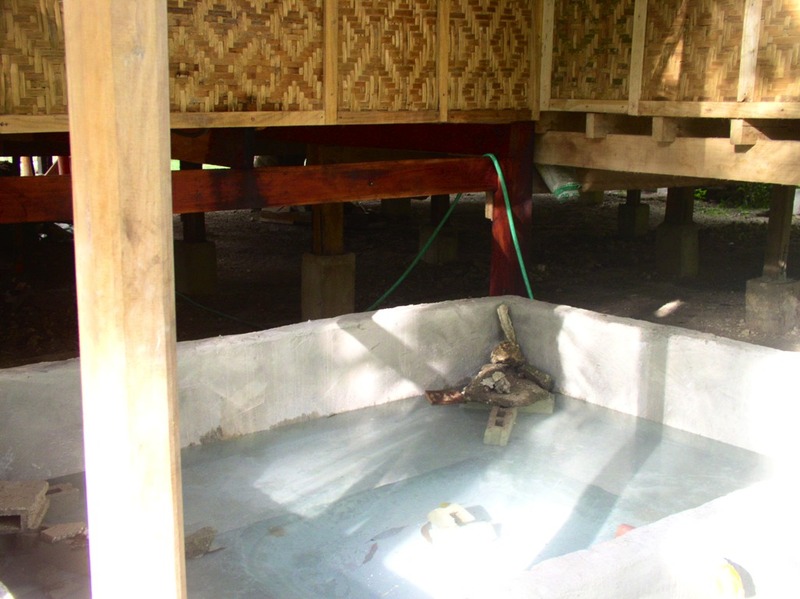 In January 2011, we decided to build a fishpond that could also serve as reservoir for rainwater flowing from the nipa roof. Without such a reservoir, we would have quite an inundation whenever it rained. 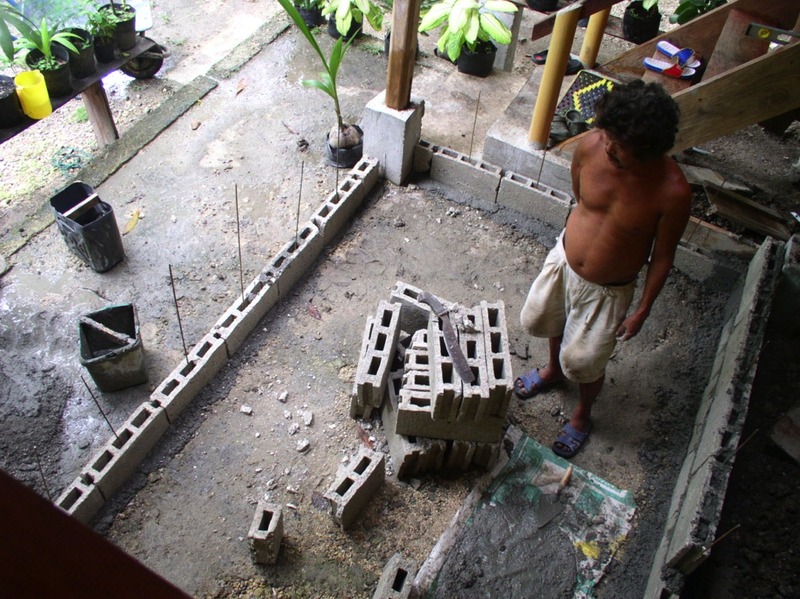 The photos below show the construction of the fishpond. Later, after the 7.2 magnitude earthquake that struck Bohol and affected the Municipal water services, such a pond proved most useful for us and some of our neighbours as source of water for cleaning and flushing. When water services are not working, this pond also provides water for the animals. 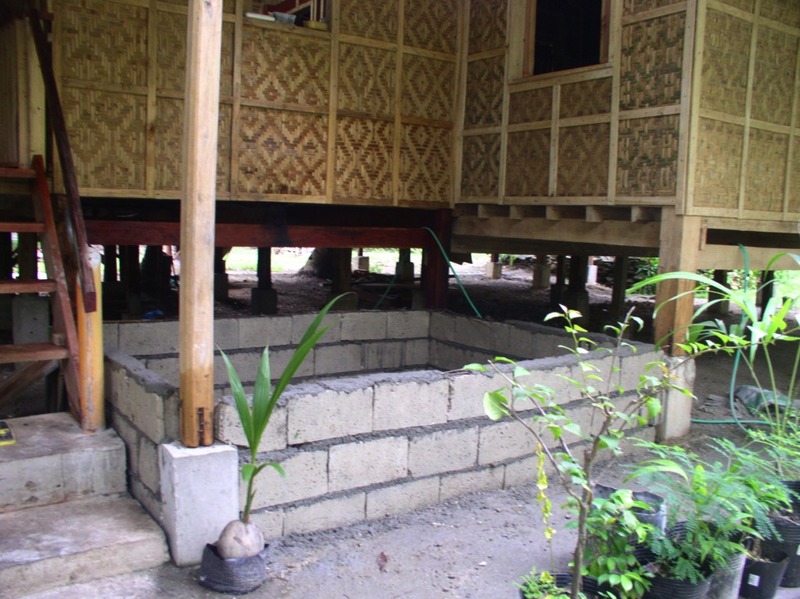 The fishpond is not very big – maybe about 140 cubic feet. Soon after cleaning it up and getting clean water in, we got tilapia fingerlings from a neighbour and some more from the Municipal fishpond. 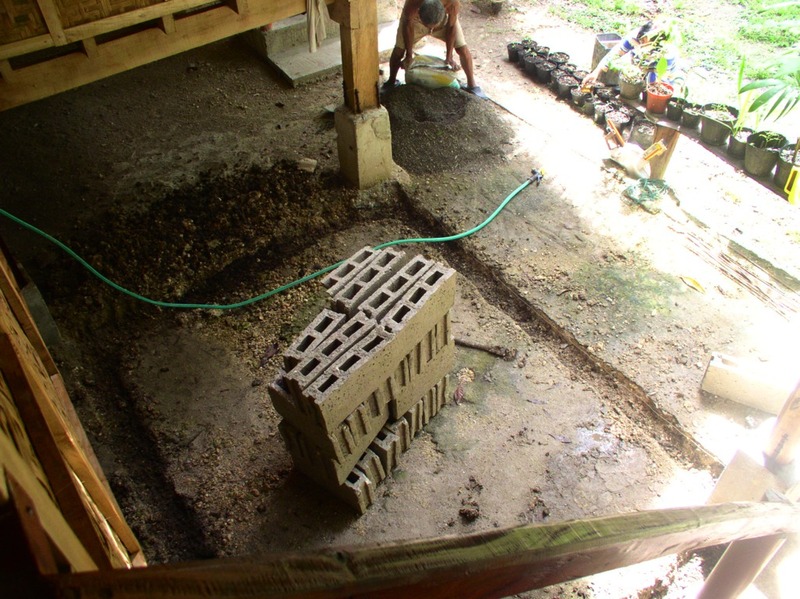 We put some old hollow blocks in as hiding places for small fish. We didn’t get a lot of fingerlings – maybe just a dozen. And from this few fingerlings, we have maintained a reasonable number of tilapia that pretty much sustain themselves. As long as there are naturally occurring food sources in the pond, such as algae and zooplankton, the tilapia can survive. 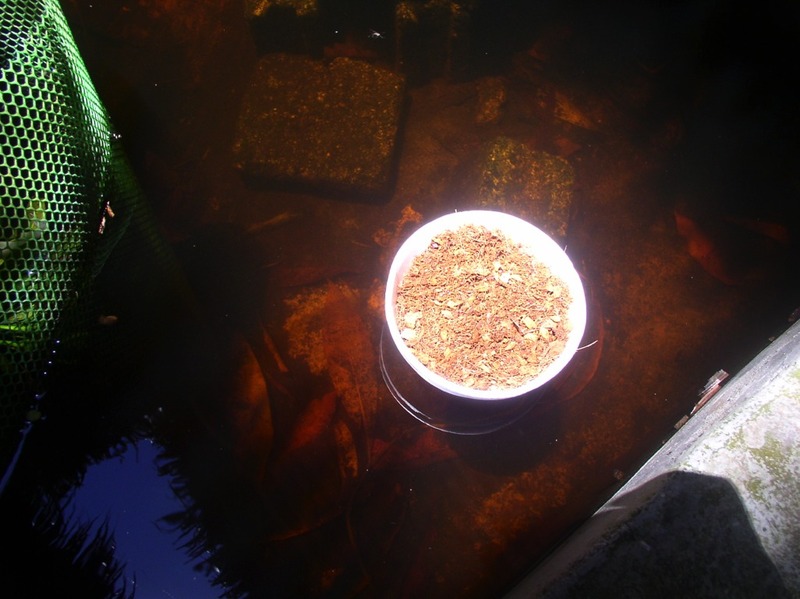 Trevor placed floating pots in the pond hoping to grow cool weather plants like lettuce, taking advantage of the cooler micro-climate of the pond. However this was not successful. Perhaps more research is needed for this. 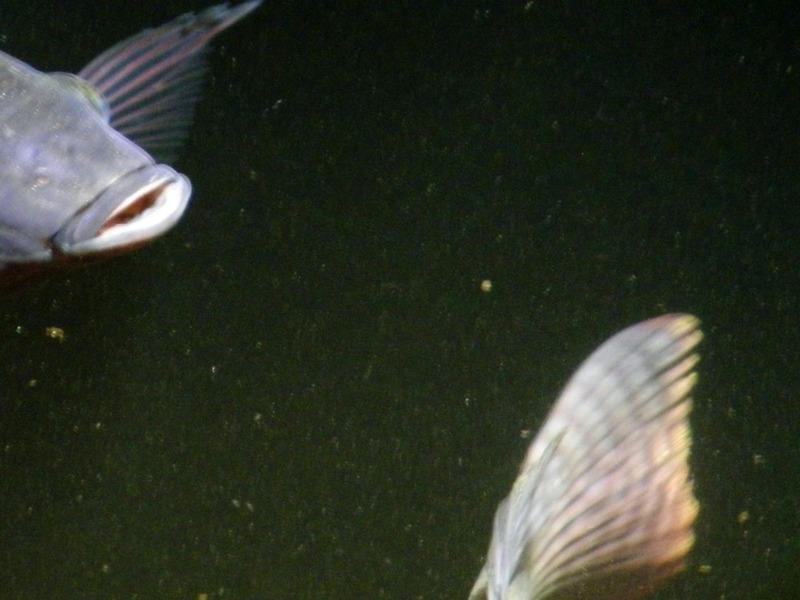 The tilapia are a voracious fish and will eat almost anything organic. To keep them from eating up all the water plants, these nettings are used. Notice the brown colour of the water. 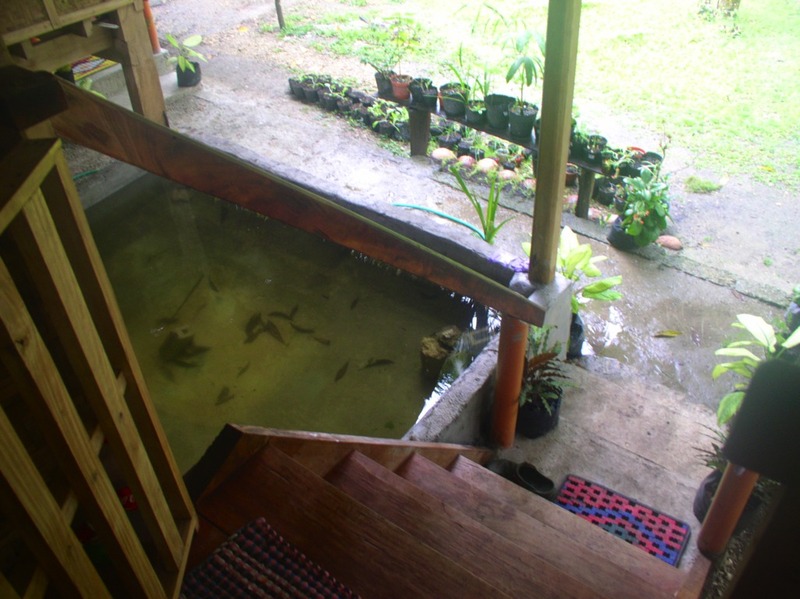 This is from the rainwater as it flows over the nipa roof and into the pond. So, at a time we would probably have about 25 adult tilapia and several more young ones (they are excellent at hiding so we could never tell how many they are)! 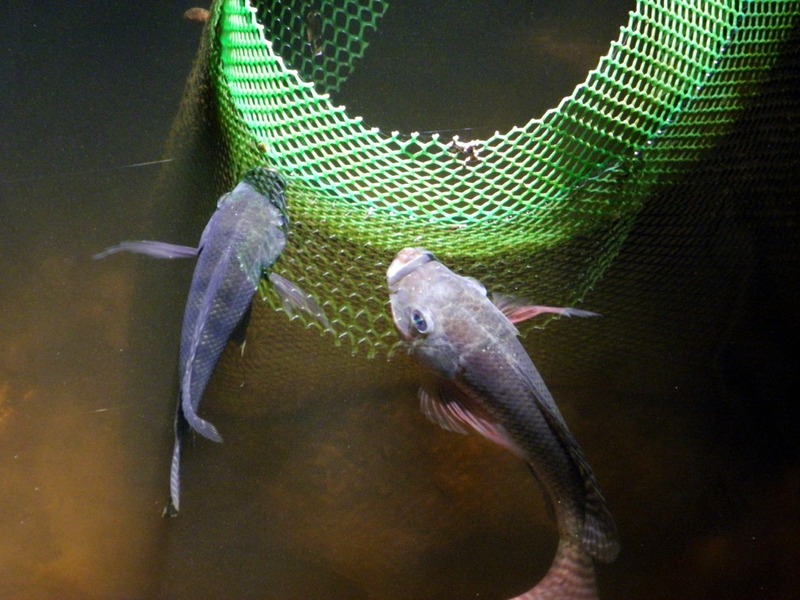 It is a good idea to catch the tilapia on a regular basis so that the small ones have a chance to grow. However, catching them is easier said than done. Our first catch. Penny and Terry caught these by putting a big net in the pond, waiting several hours, then pulling the net up swiftly. Soon, the tilapia learned the trick and Terry couldn’t catch them anymore. So I decided to use a bait with a hook and here’s my first catch. I’ve caught many more tilapia after this. I used chicken skin or raw anchovies as bait. 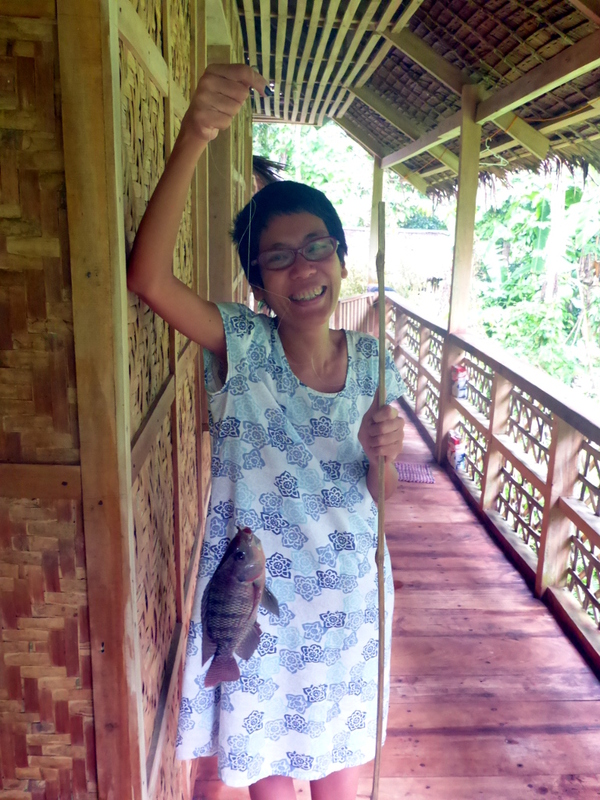 If the tilapia are hungry, it is much easier to catch them. Tilapia eat anything from algae, weeds to termites. We feed them camote tops and kangkong. Sometimes we give them a treat of commercial fish floater feeds. I also toss bits of chicken skin, pork and beef from the kitchen. The protein seems to help them to reproduce. 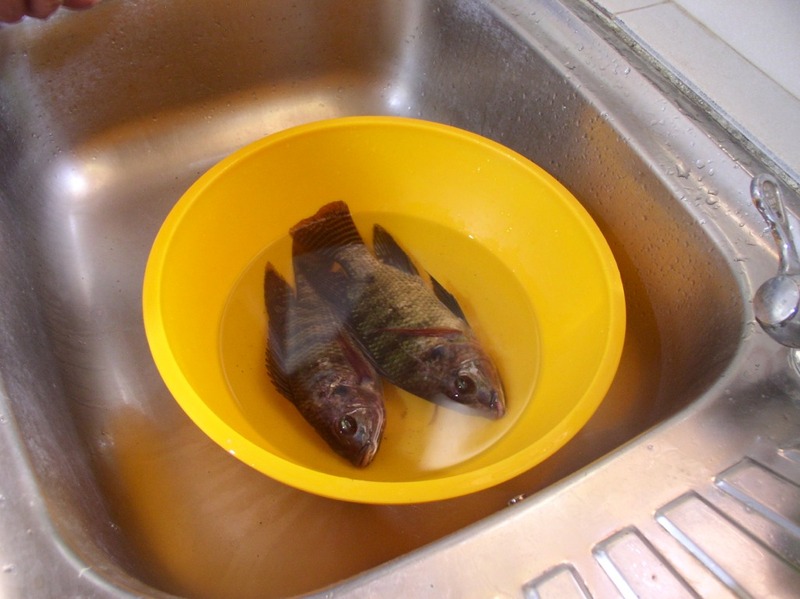 Home-grown tilapia is clean and fresh. It tastes remarkably different from those bought from large fish farms. It does not have that ‘woody’ or ‘muddy’ taste or smell. 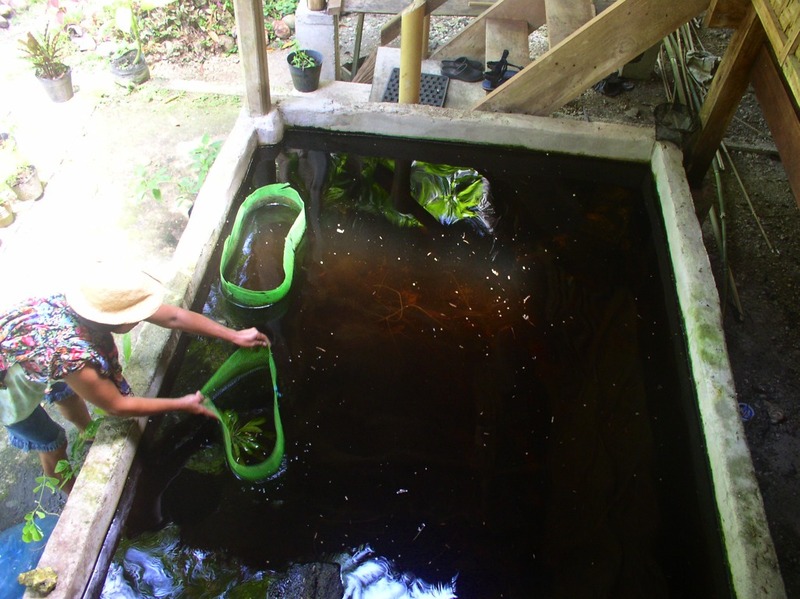 Aiming to keep a healthy biology in the fishpond, we’re still looking for other things to put in with the tilapia. We’ve put some kuhol (golden snails) in but they didn’t quite make it. Apparently, the tilapia had eaten them all. 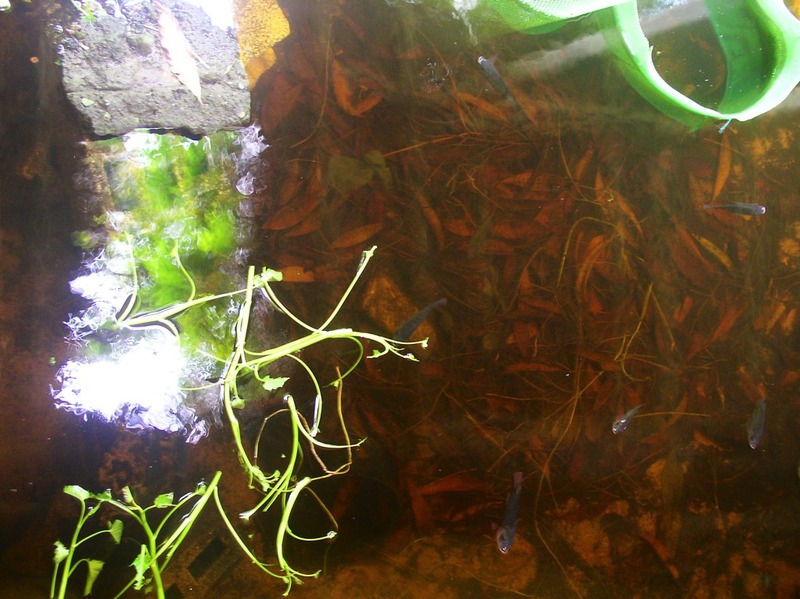 We’ve also put water hyacinths in the pond but those quickly got eaten by the tilapia as well. Perhaps later we can look for some catfish which are known to thrive well together although catfish are predator fish (fish-eaters). This is where little hiding places or fish refuges are necessary. We have tried putting tilapia in the duckpond. However, that was not successful. All the tilapia died. 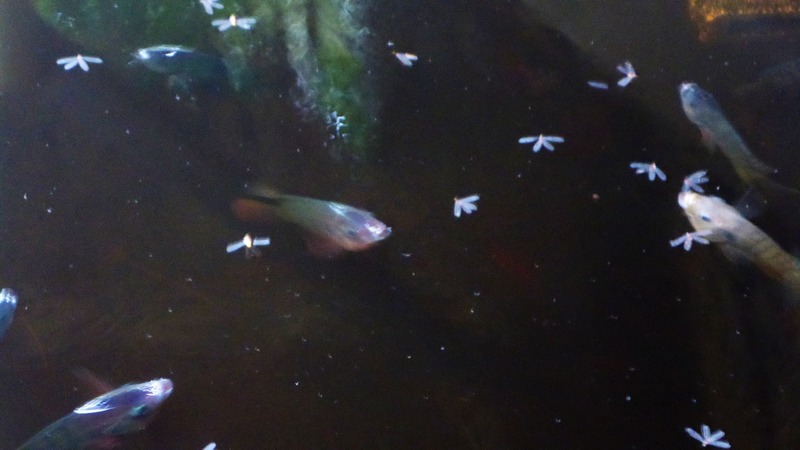 It seems that the large population of ducks and the amount of manure was too much for the fish, depleting oxygen in the pond. The duckpond is also only about the same size as the fishpond. For now, all we have are two turtles living in the duckpond!